Cygnus is not only the 16th largest constellation in our solar system (made up of seventeen main stars) it is also home to a strikingly beautiful and intriguing Nebula called, the Veil Nebula. NASA’s Hubble Telescope has zoomed in on this celestial marvel to reveal one of the most fascinating space pics you may ever feast your eyes on. Check it out! Being coined as a “crumpled bed sheet” in appearance, the remnants of a once massive star (about 20 times that of the Sun) is now providing us with a stunning display of gases and light. The explosion of this star happened around 8,000 years-ago which created a fast-moving blast wave that continues to plow into a bank of cool, dense interstellar gas, along the edge of a large area of low-density gas. The Veil Nebula is located about 2,100 light-years away and spans approximately 110 light-years across. However, the picture taken by Hubble is only a small portion (two light-years) of what this wonder has to offer. The image from Hubble shows the collision from the blast wave and the dust and gas in space – the bright regions are where the shock wave is colliding with denser material – and is seen on edge. As you can see in the image, there are different colored regions which all have a corresponding chemical; red is the glow of hydrogen, green is from sulfur and blue is being created by oxygen. The more chaotic structure of the red is from an earlier time when the cooler gas was worked up by a shock collision. From this a few thin red filaments arise from gas being forced into a shock wave at the intense speed of one million miles-per-hour. This speed is comparable to traveling to the moon in 15 minutes! This current picture is certainly fascinating but also reveals some new information to researchers. The Veil Nebula was first photographed in 1997 and since then has expanded. Scientists will use this information to further predict the nebula’s behavior. Although the Veil Nebula is gaining all the attention in “the Swan,” this constellation is home to other fascinating wonders. Here are 10 facts you may not have known about Cygnus. ~ This constellation was first cataloged by the Greek astronomer, Ptolemy, in the 2nd century. ~ A deep space object located in this constellation called, Cygnus X-1 is notable for being an X-ray source. 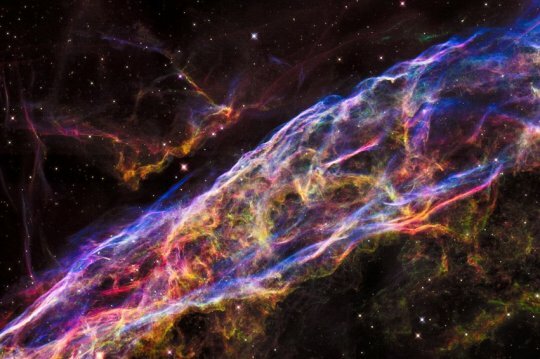 The Veil Nebula may not be the most unusual photo Hubble has ever revealed, but the beauty it portrays is only outshone by the intriguing facts of how and where it all began. As star and space-gazers we should be thrilled by the opportunity Hubble and the internet allows us to witness. It’s an exciting time to be alive, so keep your eyes peeled and your curiosity at its peak…you never know what other wonders are lurking above just waiting to be discovered.